Hands up if your make-up bag is fit to burst? 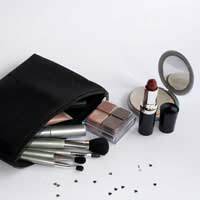 Most of us have far more make-up than we actually need but which items are actually essential for a basic make-up kit? For most women, foundation is a complete godsend. It can cover blemishes and freckles, and evens out your skin tone. They also act as a protective barrier against the elements, as well as stopping dirt and grime from blocking your pores. It can be challenging to find the exact shade of foundation that best suits your skin tone, but several ranges are now available that claim to adapt themselves to match your skin tone. The liquid and cream varieties are the most popular. Oil-based liquid foundation is best for dry or more mature skin. It gives a matte finish. Water-based liquid foundation gives a lighter coverage, and is more suitable for oily or sensitive skin. Creams are also good for dry skin. Although the coverage they provide is heavier than some liquid foundations, they still offer a glossy finish. Blusher adds that all-important healthy glow, and can act as a highlighting tool by emphasising your cheekbones. Powder blusher is still the most popular type of blusher, as it is less fiddly than the cream variety. As a general rule, look for a blusher that is the same colour as your natural blush. This will create a healthy-looking glow, rather than one that looks like you’re permanently embarrassed. Powder sets your foundation in place, which gives a smooth finish to your make-up, and blots any shiny patches along the T-zone (forehead, nose and chin). Loose translucent powder is usually the best choice. They give a more natural finish than pressed powder, which often streaks. A matte translucent powder is a good idea for oily skin, as it will absorb oils in your skin. Concealer is supposed to cover up blemishes, scars and dark circles that your foundation can’t. As it’s not meant to be noticeable, opt for a shade that’s half a shade lighter than your skin tone. A yellow-based shade is recommended for under the eyes, as it will cancel out the dark circles. If you only wear one item of make-up, lipstick is a good choice. It can add a splash of colour to your face and brighten your complexion. As with all types of make-up, the key is to choose the right shade of lipstick to suit your colouring. It’s always tempting to pick a shade that’s currently in fashion, but it won’t necessarily suit you. It’s far better to opt for a shade that works with your features and helps them to stand out. The right shade of eyeshadow can really open up your eye area and make your eyes look a lot bigger, but the wrong shade can make small eyes look even smaller. There are so many different shades available at the moment, but you can’t go far wrong with neutrals, as they tend to suit most skin tones. Eyeliner comes in two main forms: pencil and liquid liner. The pencil is the most popular as the look it creates is less, and can be smudged for a soft, smoky appearance. The liquid liner is perfect for creating dramatic looks (think Amy Winehouse’s edgy eye make-up), but it can also make your eyes look smaller, so it’s not for everyone. Mascara finishes off your eye make-up, and frames your eyes when applied to both the top and bottom lashes. Brown is the best option if you have fair skin, whereas black is better suited to darker colourings. It’s not just the products that you apply to your face that make the difference - the brushes that you use to do so can also have a big impact. If you can afford it, splash out on some good quality brushes, as they really will have a big effect on how well you can apply the make-up. It goes without saying that they need to be kept scrupulously clean to avoid infections. If you’ve had your make-up for more than six months, now is the time to throw it away. Old make-up is a breeding ground for bacteria. Hi, Am in Africa and was wondering where i can find good, full make up kits because have tired but all in vain. Thanks.